I was browsing through my favorite, independently owned movie rental store this evening (I'm not a big fan of the big chains), and ran across a copy of Samuel Fuller's I Shot Jesse James. I had never actually heard of the film before, so I rented it out of curiosity, especially with The Assassination of Jesse James by the Coward Robert Ford making its theatrical debut tomorrow. And I must say I was pleasantly surprised. It may have been a B-western with some hokey moments, but it's solidly crafted and remarkably engaging. It tells the story of Robert Ford, an outlaw who shot his best friend Jesse James in the back in exchange for amnesty, and how the murder haunted him for the rest of his life. The film, which was Fuller's first, focuses more on the aftermath than the friendship between James and Ford, examining the psychological unraveling of a man who murdered his best friend for love, and how it destroys his life. 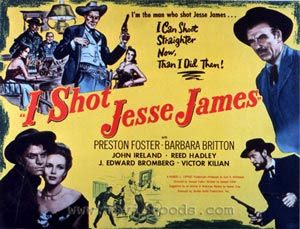 Unlike many westerns of its time (it was released in 1949), it features a mix of character-driven drama and gunslinging action. It's a B-movie with a brain, and an exceptionally suspenseful and entertaining one at that. The film is available on Criterion's excellent Eclipse collection - The First Films of Samuel Fuller, a series that releases overlooked films films from specific directors or themes. The people at Criterion have done a typically excellent job of restoring the film and transferring it to DVD. The set also comes with The Baron of Arizona (1950) and The Steel Helment (1951).